Food packaging is probably a significant source of waste for you, like it was for me too! Going zero waste does NOT happen overnight! Instead, think of this as a process that takes time. Each change you make is a small step in a positive direction. 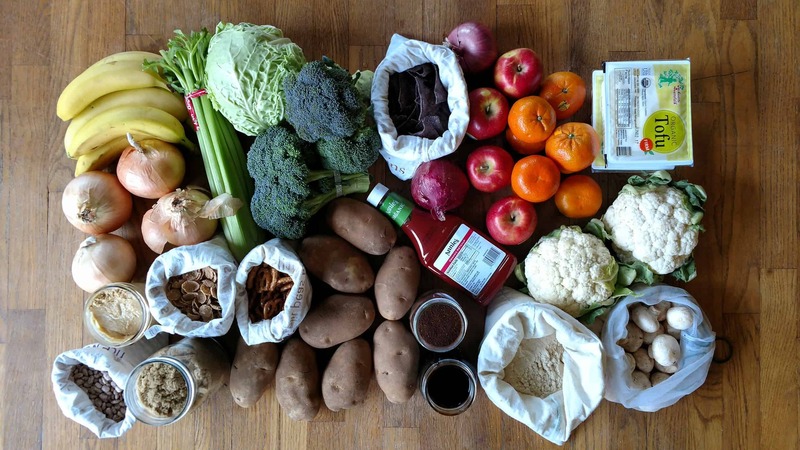 Below I’ve outlined a step-by-step guide for getting started in zero waste grocery shopping. Step 1: Make your usual grocery list. In step 1, make a list of everything that you might normally purchase for the week (or however often you go). Be thorough! List everything to your heart’s desire. If you need to add another category, go for it! Here are some common categories that can help you put together your list. Get two different colored pencils or crayons and take a look at your list. Pick one color to indicate your “must-haves” and the other color to indicate your “wants”. For example, coffee for me is a MUST HAVE. Cheese, eggs, and bread are family MUST HAVES. Either Earth Balance (vegan butter) or regular butter are MUST HAVES – one or the other. Fruits we are pretty flexible on – we can work with what’s available at the farmer’s market or what’s served loose at the store. Veggies we are also pretty flexible on. We prefer to have lettuce, carrots, cabbage, tomatoes, cauliflower, squash, and greens on a pretty regular basis, but as long as we get some variety, we are happy. We also get some veggies that work well in the kids lunches (think carrots, sweet peppers, cucumbers, or cherry tomatoes). We also have dried beans, but again we are flexible on the type of dried beans – pintos, chickpeas, lentils, kidney beans, etc. We love them all. Within condiments, we are actually pretty flexible! We like hot sauce, mayonnaise, mustard, and ketchup. Step 3: Assess the bulk situation near you. What is available to you and where? Check out the bulk finder app (Bea Johnson has one on her website here) to see what’s available near you! If nothing pops up, you might want to try stores you don’t normally go to – call ahead and ask if they have any bulk bins! Health food stores often have bulk bins. Whole Foods is a definite option. Also, don’t forget to look closely at what IS available at your favorite store. There might be more than you realize when you take a closer look! Step 4: Check for a local farmer’s market. The farmers market is an awesome spot to get fresh local veggies – often without stickers or packaging! There might even be fresh bread and other staples that you can purchase plastic free. Some staples you might be able to get in a glass jar that you can return to the farmer (at our market, that includes honey and hot sauce). So, try to determine if there’s a farmer’s market near you this time of year, and if you can fit a visit into your schedule. If you’ve got a family, it might be a fun weekend event for the whole crew! Some weekday markets are after work – maybe you can swing by one day after work! Check out LocalHarvest.org for markets near you. How many of your must-haves are available in bulk? If everything is, say hip-hip HOORAY! And then skip ahead to step 7! But, chances are there are some items you can’t find in bulk. Make a note of all of those must-haves that you can’t find in bulk. Next, make a list of all of the wants that you can’t find in bulk either. Assuming you can’t find everything in bulk that is on your must-have or want lists, now is the time to make some decisions! Ask yourself a few questions. First, are there any must-have groceries that aren’t really must haves? If not, and you stand behind each must-have, that’s fine! But it’s always good to check what you might be willing to forgo, if even for a short time, to see how that feels. Here’s another question: is there even one must-have that you would be willing to try making on your own? I am assuming you do NOT have the time to make everything yourself. Very few people do! But is there one item that you might try? Again, just food for thought. Could you set aside a little time on the weekend to make it? At my house, that’s hummus and sometimes cashew cheese. We try to make it about once a week. Now turn to your wants. Here you get to decide how badly you want those wants. You might consider an experiment of forgoing all of them, at least for a little while. The great thing about grocery shopping is that you get another chance to do it again soon and change your mind! After you’ve made your decisions, revise your list so you know exactly what you are shopping for. Step 7: Gather your supplies! Before you shop, collect your supplies! You probably have some of these items already, and can make them yourself, find them at a thrift store, and there are veggie and bulk bags for sale here as well. I always make sure that my supplies are sparkling clean before I take them. I want the stores to feel confident that I’m not mucking up their bulk goods! This helps stores continue to support folks bringing in their own containers. A scrap of paper and pen for writing down all the codes from the bulk bins (unless you can write on your bag -that works too!) or a smartphone! Reusable shopping bags. I.e., a bag for all your bags and jars! Your list that you painstakingly put together! Let me take a moment to explain about TARE WEIGHT. What is tare weight, you might ask? The tare weight, at least in the U.S., is often the number of ounces that your container weighs divided by 16. So, if your jar weighs 8 ounces, simply divide 8 by 16 to get 0.5. That is your tare weight. It means your jar weighs about half a pound. The cashiers will deduct this weight from the total weight of the item when you pay. That way you don’t pay for the weight of the jar in addition to the weight of whatever’s inside. If the store sells bulk, they should understand this process and be able to deduct the tare weight at the register. If you have a scale at home, you can go ahead and weigh your jars at home and mark down the tare weight! If you don’t have a scale at home, you can take your jars to the store and ask them to weigh them, or look for scales in the aisles that are for customers to use. I use my marker or wax pencil to then write the tare down on my jar. Step 8: Shop with confidence – and just ask! Okay, once you are at the store, now’s the time to stick to your list! Get only what is on your list, including your needs and wants. Write down the codes for each item, either on the container or on your grocery list/scrap paper. I often use my phone to track the codes, and since we get the same things over and over again, I have the codes saved already! For any deli items, ask them if they can hand it straight to you or put it into a container for you. I’ve asked them to cut cheese for me and put it into my beeswax wrap, and they’ve been happy to do it at a couple of stores! Don’t be shy about asking for help, even if no one is working the counter when you get there. Sixth choice: recyclable plastic packaging – what type of plastic can you recycle in your town? Seventh choice: non-recyclable materials. This often includes mixed materials. When I go to pay, I line up my bags on the conveyor belt in order of my codes, just to speed up the process for the cashier. You don’t need to do that at all! But if you’re motivated, it helps move things along a little bit. Especially for items you can’t see through the bag – eliminates the guessing game. I like to move my bulk goods into jars and other air-tight containers once I’m are home. I do try to take a picture first – if you want to capture the moment, do that first! I love those flat-lay grocery pics of a week in food. But then I put stuff away. 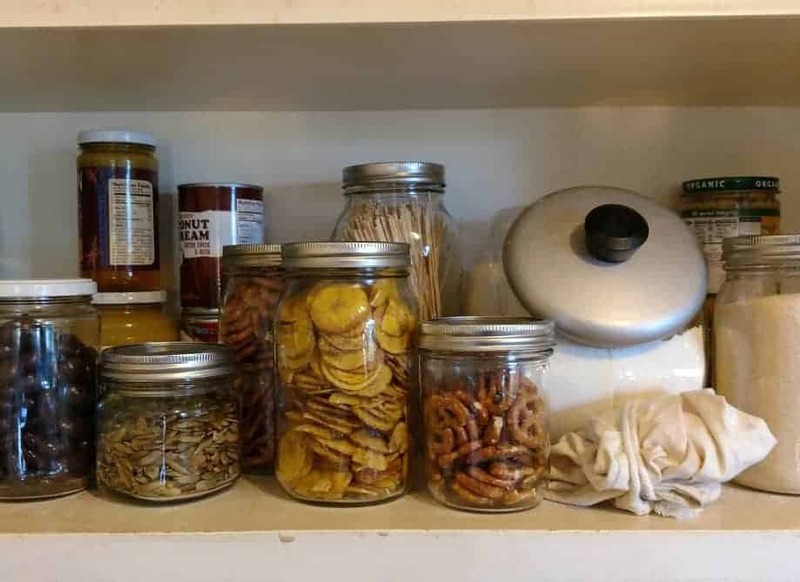 Things like chips, oats, and pasta keep better in a jar or tupperware, so I’ll take them out of the bag and put them into a different container at home. I usually keep my veggies in their bags and put them straight into the fridge. I usually take the fruit out of bags and set them on the countertop. Potatoes, onions, and garlic too – just into a bowl on the countertop. This takes about 10 minutes, but it’s a nice chance to tidy up the cupboards a little and feel stocked up for the week ahead. Phew! You did it! I hope you are feeling proud of yourself for any small changes you were able to implement towards a zero waste home. I know it isn’t always easy to try doing things differently, and your family might not be completely on board yet, but give it time and it becomes second nature. Step 1: Make your usual list – be thorough! Step 8: Shop with confidence and don’t be afraid to ask! Step 9: Bring your food home and transfer it to storage containers. Step 10: Last but not least, congratulate yourself! There you have it. My ultimate beginner’s guide to zero waste grocery shopping. Was this helpful for you? I’d love to hear what you think in the comments below.